If you are concerned about your height and you are looking for a subtle and relatively means of adding a few inches, then height increasing shoes are a great option. Maybe you have tried heel inserts but they didn’t work for you or you are just want to bolster your self-confidence with some additional height, height increasing elevator shoes are a great option. These shoes provide a discreet means of boosting your height. They look like your typical pair of dress shoes or casual shoes but have an inbuilt height increaser. However, only a few companies on the market make the best height increasing elevator shoes. Therefore, to make your work easier, we have compiled a list of the best height elevator shoes for men and women and here are the models to consider. The Georgio Brutini is a stylish pair of Chelsea boots, designed for business or work. Sleek and well-made, these height increasing boots for men will give you an upscale look the moment you put them on. They are comfortable, and they come with all the great features and details you might expect to find in a Georgio Brutini model. The uppers are made of waxed leather, which is both supple and sturdy. And with their smooth leather finish, maintaining a pair of shoes has never been easier. A simple wipe with a wet towel, followed by polishing is just what these boots need to maintain their great look and shape. Apart from being soft against the skin, the leather used to make these boots is extremely durable. These boots are weather resistant and stain resistant. Therefore, you can expect to wear them for a long period without the need for a replacement. Furthermore, their upscale look makes them perfect for business trips and meeting. These are also incredibly lightweight. It feels as if you are walking in a pair of slippers. Even if you walk with them the entire day, your feet will remain free from fatigue. You can wear them with a pair of jeans or with your dress suits, and they will always deliver. They also come with a pull-on tab on the rear, which saves you time and energy when wearing or removing them. And since they are designed as height increasing shoes, they will make you look taller than your normal height discreetly. 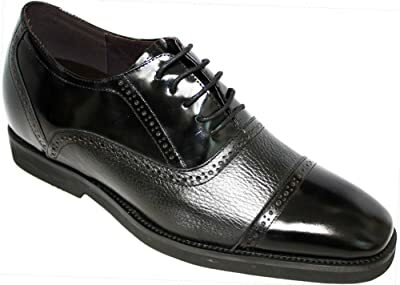 A classic and stylish wingtip oxford, these height increasing elevator shoes for men are comfortable and versatile for formal occasions through business meetings. They feature a beautiful, brown waxed leather finish. The waxed leather is also supple. However, you should avoid wearing these shoes in wet environments, since moisture can damage this leather. You will also notice that their height increasing design is inconspicuous. Their hidden heel height provides an additional few inches, and no one will ever notice you are wearing height elevator shoes. These boots are also comfortable and healthy. They feature polyether height increasing insoles, which is ergonomically designed to maintain a natural position for your feet. They come with ample forefoot room, plenty of arch support, as well as a comfortable design. Furthermore, their outsole features premium natural rubber, which supplies flexibility and shock absorption, as well as high wear resistance. Also, their hollow design enhances their breathability, thus ensuring your feet remain cool, fresh and odor-free. As much as these shoes might cost higher than others on the market, you can rest assured that you are getting value for your money. They are comfortable and durable. Also, they will give you a good lift while ensuring you remain stylish. CHAMARIPA is one of the leading brands when it comes to height elevating shoes for men. And with these dress shoes, you will feel confident, taller and more comfortable throughout the day. Furthermore, their simple design makes them suitable for both for formal or business occasions. You might have come across height elevating shoes that appeared outright bulky. Well, that is not the case with these shoes. Their feature a lightweight design, thanks to the use of natural rubber. Apart from that, no one can notice that you are wearing height elevating shoes until they walk in your shoes. Moreover, the height-increasing material used in this pair of shoes will maintain their structure throughout. As noted above, the outsole is made of natural rubber, which has a high wear resistance. Furthermore, the materials used to make these shoes are highly breathable, thus eliminating issues of unpleasant odors, even if you wear them the entire day. Just like most height increasing shoes from this brand, these are equipped with a polyether whole insole, which conforms to the biomechanics of your foot, thus making sure your feet remain healthy and comfortable, even after prolonged periods of walking or standing. 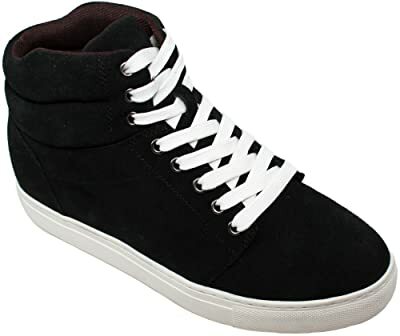 If you are looking for height increasing elevator shoes for men that are comfortable, lightweight and stylish, then these shoes deserve a consideration. Their craftsmanship is great, they look stylish, and their maintenance is a breeze. CHAMARIPA believes in quality and you are assured of getting value for money when you purchase these shoes. These elegant dress shoes are designed to leave you looking great while lifting you up slightly. It features a simple but classic style, with cowhide leather for long-term wear. These stylish height elevator shoes will complete any formal or casual look. Their uppers are made of cowhide leather, which is soft on your skin and flexible, but highly durable. On the other hand, the height increasing layer features a hardness level of 55 degrees, making it impossible to collapse. Also, these shoes are lightweight. You will not feel as if you are dragging bricks on your feet. In fact, the weight change is almost negligible as compared to your ordinary pair of shoes. Also, the leather used on the upper comes with a soft interior lining, which prevents excessive rubbing. Furthermore, the upper features strategically positioned pores, which ensure the utmost breathability. Inside these shoes, your foot will be resting on a Polyether whole insole, which acts as the height elevator. Apart from conforming to the arches of your foot, it makes sure that your foot is properly aligned, thus eliminating pressure and pain on the knees and ankles. Also, the height increasing layer provides excellent arch support, thus preventing overpronation or underpronation. Whether you are attending a business meeting, a banquet, or a wedding, these shoes are perfect for all these occasions. To keep them clean, you only need to wipe them with a dry piece of soft cloth. It’s advisable to avoid contact with water at all times since the leather used is not waterproof. Classic yet fashionable, the CALTO A329013 dress shoes are an instant confidence booster whenever you step out wearing them. The leather will earn you compliments wherever you go, and no one will ever realize that you are wearing height increasing shoes, thanks to their discrete design. These stylish and durable shoes are equipped with leather insoles, which help to absorb shock while you are walking. Apart from that, the leather insoles ensure your feet are fully cushioned and comfortable. The leather used to make the upper is supple and soft, while the lacing system makes it easy to find a customized fit. These height increasing elevator shoes for men are also equipped with mid-level insoles, which protect the height elevator from damage. Also, the mid-level insoles provide breathability, thus making sure that your feet remain fresh and cool at all times, regardless of the weather or how much time they are on your feet. On the other hand, their rubber outsoles supply ample traction, while enhancing the durability of these shoes. You should also note that you can replace the rubber outsole that comes with these shoes with your preferred choice. Designed and constructed with the best materials, these elevator shoes for the groom, feature a classic and sleek styling, which will make you stand out during your wedding. Whether you are going to a job interview, to the office, or just a night out with your friends, these shoes are perfect for all these occasions. They will help you to feel relaxed and confident. They provide an ideal solution for all situations that call for height and posture improvement. The CALDEN K333011 are designed for men who are looking for a stylish pair of height elevator shoes. The materials used are of high quality and durable, the construction is top-notch, and the design itself is trendy. And with their smooth finish, maintaining these shoes should never be a challenge. Weighing approximately 15 oz, these are among the lightest height increasing shoes you can purchase today. Also, their height increasing gore is properly hidden, and unnoticeable. These height increasing elevator shoes for large feet feature a convenient lace-up design. Therefore, you can easily slip them on when you are rushing somewhere within the shortest time possible. Also, they have ample room inside, which not only keeps your feet comfortable but allows adequate ventilation. From the heel to the toe, these shoes are designed to provide ample comfort while improving your posture. You can wear these shoes with a tailored suit or casual attire. From the office to the club, the CALDEN K320021 is designed to enhance your style while giving you a secret height increment. If you want to add some height but still look great, then these shoes will get the job done. They are constructed using the ever-reliable Goodyear welt construction, which gives you a long-lasting pair of shoes. Apart from that, you can replace the original outsoles to extend the life of these shoes. Also, they come with a lace-up design, which makes it easy to obtain a customized fit while the cap-toe gives your toes enough room to wiggle and splay. Designed to provide utmost comfort, these shoes feature brogue accent details on the upper, giving them a beautiful look. CALDEN pays serious attention to the quality of their shoes as well as the materials they use. The leather used to make the CALDEN K320021 is of high quality. On the other hand, it will feel soft against your skin while protecting your feet against the elements. Their rubber outsole will supply ample traction while the vents on the upper ensure adequate aeration to your feet. You will love the comfort of these shoes, their versatility as well as their style. And they will also earn you numerous compliments. If you are looking for a lightweight pair of height increasing shoes, then you don’t need to look further. CALDEN is a renowned brand when it comes to height elevating shoes for men and women. And with the K107201, you have a pair of high-quality height increasing shoes, which you can use for running errands, walking the trails, casual occasions, as well as other light duties. You can even use these height increasing shoes for a hike, and your feet will remain comfortable throughout. Featuring a sneaker design, these shoes feature rugged suede upper, a rubber outsole and sturdy laces for exceptional durability. Furthermore, the tongue and collar come with thick double padding, which will provide ankle support while improving the comfort levels of these shoes. On the other hand, the fully rubberized bottom delivers grip and traction, while absorbing impact during movement. These are designed for men who want some additional height in a pair of sneakers. Cushioned like a pair of sneakers but equipped with the traction of hiking boots, these boots are ideal for a wide range of casual occasions. When it comes to height increasing elevator shoes for men, you can never go wrong with a pair from TOTO. And with the TOTO-A53271 you have a stylish, durable and comfortable pair of shoes, which will instantly make you 3.2 inches taller. These shoes are designed to add a few inches to your height discreetly while keeping your feet comfortable. Their height increasing technology features 3 main components – leather insoles, mid insoles as well as rubber outsoles. The leather insole also acts as the height increaser. It also serves as a shock absorber when you are walking or standing while keeping your feet fully cushioned and comfortable. When you have these shoes on your feet, you will never experience issues of discomfort or fatigue. On the other hand, the midsoles protect the height increaser against deterioration while providing ventilation. As for the outsoles, these are designed to protect your instep while promoting natural movement. Furthermore, you can easily replace the rubber outsole once the need arises. These shoes are perfect for a wide range of events and occasions. You can pair them with a pair of jeans for a stroll around the city or wear them with khakis for a semi-casual feel. Developed by a team of professional shoe designers, the TOTO-A53271 are an instant height and confident booster, while making sure that your feet are as comfortable as possible. They might take some time to get used to, but once you have broken them in, your feet will enjoy utmost support and comfort. And even your closest friends will never realize you are wearing height elevating shoes. The CHAMARIPA men’s oxford is a breathable and high-quality pair of shoes, which offers excellent arch support, ample room in the toe box and superior comfort. Its simple design suits both formal occasions and the business environment. With uppers made of genuine cowhide leather, these durable shoes will give you an instant height increase of approximately 3 inches, immediately once you slip them on. Their interior is then lined with pigskin leather, which is soft, comfortable and highly breathable. Unlike other height increasing shoes, these will not leave you with any pain or discomfort on your feet. In fact, they come with padded insoles, which conform to the shape of your feet while increasing your height. On the other hand, their classic design means that you can wear them for different occasions, and you will never appear underdressed or overdressed. With these shoes, you are assured of an instant confidence boost. And it doesn’t matter how much time you spend wearing these shoes; comfort will always follow throughout the day. The outsoles are made of genuine rubber, which enhances the durability of these shoes. The rubber outsole also absorbs impact when you are walking, thus minimizing stress and strain on your knees, ankles, back, and other joints. Whether you are going for a date, meeting, wedding or a party, it’s time to strike a confident pose with the CHAMARIPA men’s oxford. If you are looking for ways of adding some height without using wedge or heel inserts, then this pair of shoes is a great option. They come with uppers made of breathable air mesh while the sole unit is made of durable rubber. Their comfort is enhanced further by the use of a pigskin lining, which is soft to the skin while preventing hot spots and blisters. These shoes also feature a lightweight design, which means you can walk or work in them the entire day without experiencing any fatigue or discomfort on your feet, knees or ankles. And despite their lightweight design, the materials used are sturdy for improved durability. Height increasing elevator shoes should give you additional height in a healthy way, and that’s what these shoes are all about. The height increasing polyether material conforms to the arch of your foot, thus ensuring proper support. On the outside, they look like an ordinary pair of sneakers and not height increasing shoes. And with a hardness of 55 degrees, you will wear these shoes for a long period without the height increaser collapsing. This classic lacing sneaker also features a hollow design, which increases breathability. These are suitable for a wide range of outdoor activities such as sports, light hikes and regular daily use. If you are concerned about your height and you are looking for a comfortable and discreet way of adding some few inches, then he CALTO G71302 are ideal for your needs. These shoes will give you an additional height of 3.2 inches while keeping your feet comfortable and properly supported. Furthermore, no one can tell that you are wearing height increasing shoes, since the height increaser has been discreetly built inside the shoes. Featuring smooth leather upper and a rubber sole, these height increasing elevator shoes for guys will keep your feet light and comfortable, wherever your day takes you. These dress shoes are elegantly double stitched to enhance their style while providing extra durability. The use of Goodyear welt construction improves their longevity further. They fit well and their style is great for formal occasions. Once you lace them up, your foot will remain securely positioned, without unnecessary movements. Furthermore, they are equipped with a double padded collar, which provides further comfort while the rubber sole supplies ample traction to keep your feet stable on the ground. When you have these shoes on your feet, you will not only have some additional height, but your feet will always be comfortable and properly cushioned. And their unique style will follow you wherever you go. A uniquely styled pair of shoes, the CALTO G5823 is a great pair of shoes for working in lightweight comfort throughout the day. They give you an extra height of 3 inches, without compromising on comfort and support. 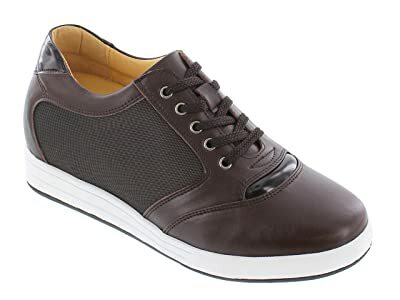 These elevator shoes for guys also comes with an easy slip-on design, which saves you a great deal of time and energy, whenever you are wearing or removing them since you don’t have to deal with laces. Their collar is lightly padded to provide ankle support while minimizing chafing. Apart from that, the extra thick stitching details give them a stylish appearance while enhancing their durability. Featuring a semi-square toe, these sturdy shoes give your toes ample room for maximum flexibility and splay. Your toes have enough room to lie next to each other without feeling squeezed or uncomfortable. The spacious toe room also improves their overall comfort. The rubber sole used on these shoes is shock absorbent. It also supplies cushioning as well as traction, thus making them great for urban pavements and concrete surfaces. When you purchase the CALTO – G5823, you are getting a subtle height increasing pair of shoes, which is full of style. They are shock absorbing, comfortable on your feet and soft on your joints. Also, these shoes will earn you lots of compliments during gatherings. And what more could you ask for? The CALTO G51123 is a handsome pair of wingtips, designed to keep you smart and stylish while giving you an additional 3.2 inches. These shoes are designed to be durable, and you can wear them with a wide range of outfits. You can wear them to work, or other formal occasions and people will barely realize you are wearing height increasing shoes for men. And despite the addition of a height increaser, these shoes only weight 17 oz. Thanks to their lightweight nature; you will enjoy their height increasing capabilities without any fatigue on your feet. Also, their collar features light padding to provide ankle support as well as additional comfort. These are made of high-quality leather. Apart from that, they are elegantly stitched for guaranteed durability. Just like other parts of the body, your feet will sweat during the day. If this sweat accumulates, it can lead to unpleasant odors as well as other forms of discomfort. Luckily, these shoes come with vents on the upper, which enhance their breathability. On the other hand, the rubberized bottom supplies plenty of traction thus making sure that you are safe from slipping and sliding. Whenever you are walking with a pair of CALTO G51123, your feet will always be properly cushioned and comfortable. 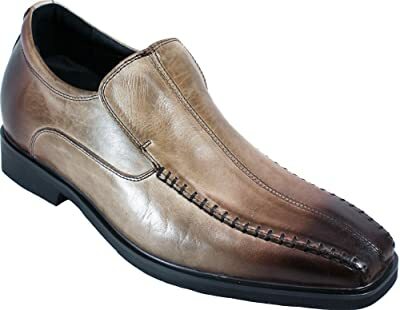 Made of high-quality leather, the CALTO G60128 is a handsome pair of height elevating shoes for men, designed to give you an additional 3 inches in a stylish way. These shoes are stylish, comfortable and durable, while their innovative design enhances your appearance while providing additional height discreetly. Designed by a team of professional shoemakers, the CALTO G60128 features a 3-stage construction process, to ensure you get a high-quality product. Similar to other height elevating shoes from CALTO, the G60128 is equipped with leather insoles, mid insoles, and rubber outsoles. The leather insoles supply shock absorption, cushioning and comfort as well as the lifting your foot slightly off the ground. On the other hand, the midsoles ensure these shoes are highly breathable while protecting the leather insoles against damage and deterioration. Also, these stylish shoes feature elegant double stitching, which not only strengthens them but helps to secure the height increaser. Their fit is great, support is adequate and you can wear them for different formal occasions. Whether you are going for a business meeting, a job interview or just a normal day at the office, these shoes are a great companion. The Calden K288021 is a sleek and stylish pair of wingtip ankle boots, designed to provide comfort and support to your feet while supplying an additional height of 3 inches. Their height elevator is disguised in a way that they appear like ordinary ankle boots. Made of high-quality leather and rubber soles, these shoes will provide your feet with all the comfort they need, while making sure you maintain your stylish side. Furthermore, these elevator shoes for men are suitable for different events and occasions. If you are rushing somewhere, then you will appreciate the slip-on design of these shoes. Wearing and removing them is a breeze. Furthermore, the pull-on tab on the rear makes your work significantly easier. Also, they are elegantly stitched to give them extra durability while enhancing their style. These sleek shoes will increase your height without making it look visible from the outside. And with their durable rubber outsole, you are assured of traction especially on concrete surfaces and urban pavements. The CALTO G1089 features a waxed leather upper, which gives these shoes a vintage and rustic effect. Their height increaser is well disguised, while their style makes them perfect for formal occasions such as business meetings or office wear. They come with uppers made of supple and sturdy leather, which feels soft against your feet while protecting your feet. The leather and the outsole are connected through the ever-reliable Goodyear welt construction, resulting in a durable pair of shoes. Their durability is enhanced further by the double stitching on the leather, which also improves their style. These shoes are designed to increase your weight in the most discreet means possible. They are stylish and comfortable, while their rubberized bottom will give you the traction you need for walking on different surfaces or pavements. Inside, these shoes come with a double midsole and insole layer. The leather insole acts as the lift while providing cushioning, comfort and shock absorption. These height increasing shoes for men are also highly breathable, which helps to keep your feet fresh and cool. The ventilation can be attributed to the midsoles, which also protect the leather insoles against premature wear and tear. The CALTO G1089 are further equipped with replaceable rubber outsoles for additional comfort, support, and stability. If you have short stature and you are looking for an instant height increasing solution, then you just need a pair of the CALDEN K50657. These shoes will instantly add you 3.2 inches, thus boosting your height, as well as your confidence. And if you prioritize style and design, these height increasing shoes are just perfect for you. Apart from that, they are ergonomically designed to conform to the shape of your foot, for all-day comfort. They come with a shaft height of 6.5 inches, designed to provide support as well as protection to your ankles. These CALDEN K50657 elevator shoes are made of genuine leather, while the interior features faux leather lining for comfort. Also, the faux leather lining also provides warmth, making them suitable for people that experience plenty of cold weather. Their round toe design offers your toes ample room, thus making sure they are not squeezed and they can breathe comfortably. Wearing these shoes and removing them is fast and effortless, thanks to their lace-less designed, combined with the side zipper. Assembled using the Goodyear welt construction, you can rest easy knowing that these shoes will serve you for many years. Furthermore, this construction makes it easy to replace the outsole, in case it wears off faster than the upper leather. For style, comfort and durability, you can never go wrong with this pair of height elevating shoes from CALDEN. With 3 inches of additional height, the CALDEN – K228061 is a great lace-up pair of shoes, designed for running an errand or going to the office, among other uses. They are made of full-grain, high-quality leather, featuring double stitching for durability and style. Their shaft rises 6.5 inches high for ankle protection. On the other hand, the in-built inner sole delivers height elevation, while ensuring your feet have adequate cushioning, comfort and support. And with their Goodyear welt construction, combined with a durable outsole, these shoes are built to last. Most people avoid height increasing shoes, based on the assumption that they are bulky and ugly. However, you will never have issues with these shoes. These shoes are made using lightweight materials. Also, it will be quite hard for people to notice you are wearing height increasing shoes unless you tell them. And why should you? Furthermore, these are extra stylish. In fact, they are smarter than your ordinary pair ankle-high boots and they come with the added advantage of boosting your height. CALTO has been making shoes for more than 20 years. And with the G8817, you have a unique means of adding some inches to your height. Apart from being pretty, these shoes come with outstanding comfort and adequate arch support. And they only weigh 15 oz, making them lightweight on your feet while minimizing fatigue when you are walking or standing. They are made of mesh and synthetic uppers, which are highly breathable. These shoes will, therefore, keep your feet fresh and cool, even when the temperatures outside are rising. These height increasing shoes for casual occasions are finely stitched to give them long-lasting durability. Also, they come with ample padding on the tongue and collar, for additional comfort and cushioning, while preventing chafing. These are also equipped with a soft cloth lining, which prevents friction, blisters, hot spots and various other forms of discomfort. Even after wearing them the whole day, your feet will remain comfortable all through. If you are looking for a lightweight, comfortable and breathable height increasing elevator shoes for men, then you should check out the CALTO G8817. If you are looking for a lightweight pair of shoes, which you can use for various outdoor activities, then the ONEMIX Air deserves a consideration. These shoes feature a unique sloping tongue, which cushions your instep against the pressure exerted by the laces while enhancing their overall comfort. Apart from that, the sloping tongue design promotes air circulation around the instep, thus keeping your feet cool. As noted above, these shoes are incredibly lightweight, and their rubber outsole is abrasion resistant. And most importantly, they are height increasing. They will give you an additional height of 2.5 cm, making you feel as if you are walking on pillows. Inside, they are equipped with a 360 air-cushion sole, which supplies shock absorption and cushioning, therefore alleviating strain from your knees and back. Also, the soft deodorant sole supplies additional padding as well as arch support. These shoes have great arch support, their colours are vibrant, and their collar is padded to give your ankles adequate support. On the other hand, the biomimetic octopus outsole offers a firm grip on the surface. You can wear these shoes for cross training, jogging, travelling, daily gym sports, casual athletic wear, tennis or running, among others. Regardless of the amount you spend standing or walking in these shoes, you will not experience any fatigue. The XXHC Camouflage is a comfortable pair of shoes, designed to increase your height stylishly and discreetly. They are lightweight to the extent that you feel as if you are wearing slippers. And despite being lightweight, they are properly constructed with sturdy materials, to make sure you get value for your money. Furthermore, unless you are wearing these shoes, it’s hard to notice they are height increasing shoes for women since the lift is inbuilt within the shoe. You can match them with camouflage pants and shirts, to complete that look. 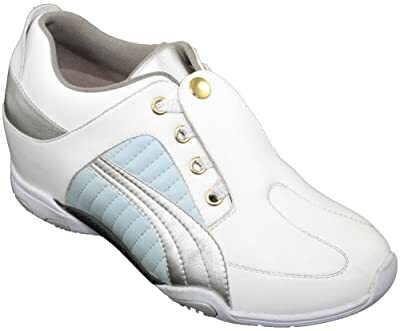 These height increasing elevator shoes for women are also outfitted with a padded tongue and collar, for additional cushioning, comfort and ankle support. These are perfect for various outdoor activities such as playing tennis, a night out with your friends, window shopping or running errands over the weekend. They are so comfortable and lightweight that it’s easy to move around with them, without any feeling of fatigue or pain on your feet. Their uppers are made of canvas material, which is highly breathable. They are also equipped with a moisture-wicking sockliner, which prevents foot odors. On the other hand, their TRAXION outsole delivers the perfect combination of grip and stability, making them ideal for a wide range of outdoor activities. 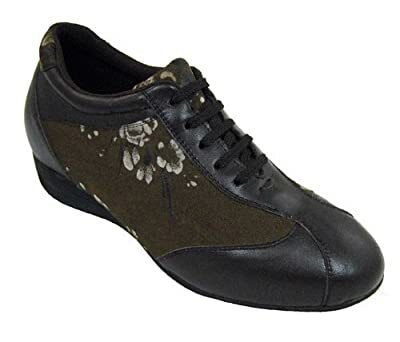 Made of genuine leather, these height increasing shoes for ladies are designed to keep your feet comfortable at all times, while giving you an additional lift of approximately 1 to 2 cm. They feature a round head design, which provides ample room for your toes. Furthermore, they come with a large shaft opening, while the side zipper makes it easy to slip them on and off. The side zipper also gives them a stylish edge. Although they are height increasing shoes, they appear ordinary from the outside. The height increaser is hidden inside the shoe, making it unnoticeable. They are made of soft, high-quality leather. It feels soft on your skin while its flexibility makes it easy to walk with these shoes. Apart from that, they are easy to maintain. Inside, they are lined with cowhide leather, which is both breathable and comfortable while their outsole is made of natural rubber, which is both anti-slip and wear resistance. When you step out with these shoes, you can rest assured that you will earn numerous compliments wherever you go. If you are looking for a comfortable means of increasing your height when wearing different types of shoes, then you should purchase these lift inserts. These inserts will offer you an additional height of 1.25 inches while ensuring that your feet remain super comfortable all through. Featuring an anatomical heel cup, these inserts will deliver maximum support to your feet as well as comfort throughout the day. Furthermore, they are manufactured using air bubble technology, which provides cushioning and shock absorption, especially during physically demanding activities. You will also appreciate the fact that these inserts are adjustable. You can detach the half-inch piece at the bottom, thus making it easy to customize their height according to your specific needs. You might be worried that these heel inserts might lead to feet problems in future. However, they are designed by an orthopaedic. Therefore, you can be assured that they will support your feet in the right way, promote proper alignment of your spine and help you to maintain a natural posture. Furthermore, they have remarkable versatility. They are universal, which means one size can fit all shoes, without the need for further trimming. You can insert them in your sneakers, boots and other footwear, and they will boost your height instantly. The TQGOLD Hidden Wedges are a versatile pair of sneakers, which provide an instant boost to your height without enduring the discomfort of high heels. You can pair them with a pair of jeans, leggings or even a dress. 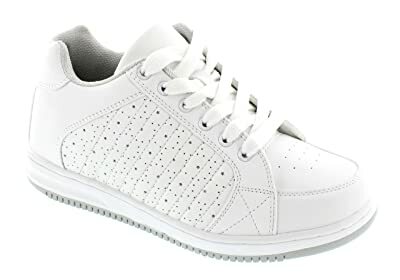 These height increasing elevator shoes for women are suitable for dinner, a stroll around the neighborhood or some light tennis. They are fashionable, comfortable and they look great. They feel like walking on clouds, and you will get compliments wherever you go with these shoes. A rear pull-on tab makes it easy to put on these shoes while the padded tongue and collar provide additional comfort and cushioning. Their uppers are made of textile mesh, which is highly breathable. It will keep your feet cool and fresh, whether you are playing tennis, walking to work or just relaxing over a cup of coffee. Furthermore, these shoes come with a moisture-wicking sockliner, which prevents the buildup of sweat while keeping foot odors at bay. Their lightweight and breathable capabilities make them perfect for summer outdoor sports. Furthermore, the outsoles of these height increasing shoes for hiking are made of high-quality rubber, which is flexible, durable and slip resistant. Elevate your look with these stylish loafers from UNN. These shoes are super comfortable and elegant. They come with a high-quality and lightweight rubber outsole, which keeps your feet flexible throughout the day. On the other hand, a 1.52-inch elevated heel gives you some additional height, thus making your legs look leaner and longer. If you spend a considerable amount of your time walking or standing, then you should get yourself a pair of these height increasing shoes for women. These are also slip-resistant, water-resistant as well as durable. Furthermore, they are a stylish choice for travelling, afternoon tea, shopping, or a date. These shoes come with a leather upper, combined with a platform rubber bottom. This combination enhances their style while providing you with exceptional levels of comfort. Apart from enhancing your style, they also supply additional height, making them a must-have in your wardrobe. On the other hand, their round-to design ensures your toes have ample room for splay while their lace-less design makes it easy and fast to slip them on. As much as most shoe manufacturers tend to throw around the word “lightweight” quite often, these shoes live up to their expectation. They are among the lightest height elevator shoes you can buy today. In fact, they are lighter than you can even imagine. The AI Aleng is a pair of lightweight sneakers, which are designed to give you a subtle increase in height while making sure your feet are comfortable. Just as their name suggests, these shoes are incredibly lightweight. They are so plush, comfortable and lightweight that you will only realize you have been wearing shoes when it’s time to remove them. Their uppers are made of synthetic materials, which are breathable and flexible. Even if you wear these shoes the entire day, sweat will not give you any problems, since they come with a moisture-wicking sockliner. The moisture-wicking sockliner also helps to prevent unpleasant odors, thus making sure your feet remain fresh and healthy at all times. Furthermore, their height increaser will not affect your walking style or lead to uncomfortable postures. It has been created in a way that it conforms to the natural contours of your feet. They also give you a great bounce and energy return, thanks to their flexible rubber outsoles. Whether you are looking for style, comfort or flexibility, all these features come packed inside the AI Aleng. Are you looking for high-quality, sturdy and beautiful height increasing elevator shoes for women? If yes, then you don’t have to go any further. The RoseG creeper boots are ideal for your tastes and preferences. They are made of high-quality materials while their floral-print design gives them a unique, beautiful appearance. You can wear them with leggings and a rugged denim top, to complete that Goth punk look. The uppers of these stylish shoes are made of sturdy leather, which provides support and protection to your feet. The leather is then combined with a rubber sole to give you a flexible pair of shoes. These height increasing shoes for women are perfect for the spring season. They are ideal for musical concerts, sports, and other leisurely activities. With their outstanding comfort, quality and beauty, these shoes are a great addition to your closet. Featuring a smooth, glossy finish and a raised wooden platform, the YING LAN women’s classics are designed to give you an instant height boost while enhancing your style. They come with beautiful uppers made of synthetic materials. The uppers have a smooth finish, which makes it easy to maintain these height increasing shoes for ladies. Their outsole is made of high-quality rubber, for maximum traction, durability and shock absorption. Also, the thick rubber outsole also supplies additional cushioning while the boosted platform gives you 7.5 cm of additional height. These shoes are also equipped with a cushioned insole, which minimizes stress and strain on your joints, improves your posture and tones your muscles. Furthermore, these shoes are water resistant. Therefore, if you live in an area the experiences frequent light showers, then you should get a pair of these. Apart from being water resistant, these are also breathable. Although their construction makes them look bulky, these shoes are incredibly lightweight. They are suitable for numerous occasions such as dates, shopping, travelling and leisurely strolls. When it comes to style and comfort, you can never go wrong with these women’s Casual Creepers. They come with a canvas upper, which is both lightweight and flexible. Furthermore, this material also comes with outstanding breathability. Therefore, if you are looking for a comfortable pair of height increasing shoes for summer, then you should consider the FOREVER FL73. And apart from being flexible and breathable, these shoes are also light on your feet. They allow your feet to move with ease while preventing fatigue. With their lightly-padded tongue and collar, chafing will never be an issue. On the other hand, the lace-up closure helps you to secure a custom fit while preventing unnecessary movements of the foot inside the shoe. They also come with cushioned footbeds, which provide shock absorption and additional comfort. Apart from that, the footbeds also provide arch support and proper weight distribution, therefore preventing stress on the knees and back. Their outsoles are made of soft but sturdy rubber, which also supplies an additional height. If you are looking for a cute pair of sneakers for hiking or walking, then you should check out the Matari women’s swing wedges. They are lightweight, comfortable and incredibly stylish. Apart from wrapping your feet in all-day comfort, these shoes also give you an additional height of 2 inches. They are made of mesh uppers, which are highly breathable. Apart from their excellent breathability, the mesh used on the uppers also makes them lightweight for fast and easy movement. These shoes are perfect for various outdoor activities during summer. Furthermore, they are equipped with pull-on tabs on the collar, which make it easy to slip them on. Also, their convenient lace-less design enhances their breathability while their rubber outsoles provide you with all the traction you need during the day. Regarding style, their uppers feature a distinctive grey color, while their outsoles have a dash of pink. You can wear these shoes with dresses, skirts, jeans or even leggings. RoseG is a renowned manufacturer when it comes to height increasing shoes for women. And these creepers live up to those high expectations. They are constructed using high-quality materials, resulting in a pair of shoes that you can wear for an extended period. 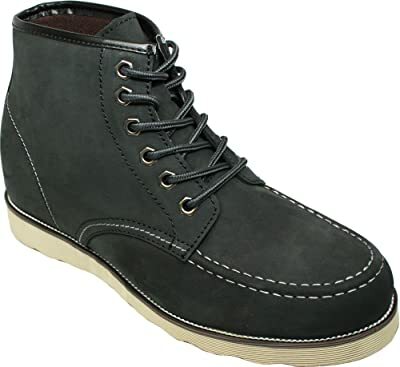 The uppers of these boots are made of high-quality suede with a soft leather lining, resulting in highly durable shoes. Besides being durable, the materials used are also highly breathable, resulting in a comfortable wearing experience. And with a shaft that runs all the way to your shins, you can rest easy knowing that your feet are adequately protected. You have probably heard that looks might be deceiving, and that is precisely the case with these shoes. When you come across them for the first time, you might have the impression that they are bulky and clunky. However, that is not the case. Despite being made of sturdy materials, these are unbelievably lightweight. When you are walking with them, you will barely notice that you have shoes on your feet. They are perfect both for outdoor and indoor activities such as parties and walking. Furthermore, they come with a wide shaft opening, and a side zipper, which makes them easy to wear. The side zipper also makes them uniquely stylish. The CALDEN K9932 are a great-looking pair of height increasing elevator shoes for women, designed like a conventional pair of sneakers. They are made of a combination of leather and suede. Most of the upper is made of suede, which gives them a lightweight feel and a stylish look. Leather has then been used to add sturdiness to high impact areas such as the toe box, and around the heel. Also, the area around the laces has also been enhanced with leather to prevent the laces from tearing through the suede. Their height increaser is inbuilt within the shoes and gives you an additional 2.8 inches, and it’s almost impossible for someone to notice you are wearing lifts. With a 5-hole lacing system, it’s incredibly easy to obtain a custom and secure fit for your feet. CALDEN never disappoints when it comes to comfort. The K9932 features a padded collar and tongue. The padded collar ensures proper ankle support while the collar prevents laces from exerting pressure on your instep, even if you tie them tightly. These height elevators also come with a spacious toe box, which gives your toes enough room to wiggle and flex. Besides that, they are equipped with rubber outsoles for reliable traction and grip. Manufactured by one of the leading names in the footwear industry, the CALDEN M109 are versatile height-increasing shoes for different casual occasions. 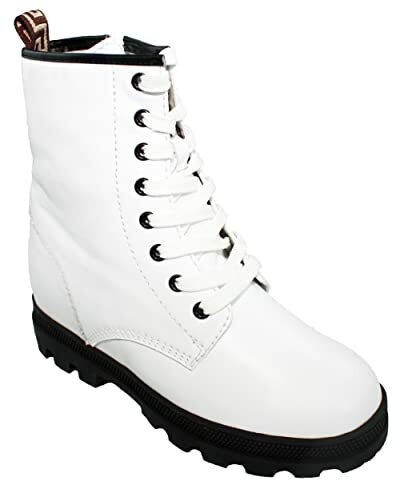 Featuring white leather uppers, these boots are just what you need to run errands in the city, attend your friend’s birthday, or even a dance night. If you have always felt short when you are in the company of your friends, then you can finally stand tall with these on your feet. They also give you an additional height of 3 inches, without telling the whole world about it. Some people avoid shin-high boots because they can present some challenges when wearing, especially when the shaft opening is narrow. But with these shoes, you are in luck. They are fitted with a side zipper, together with a pull-on tab, which makes your work significantly easy when wearing them. And once you have secured the laces, your feet will enjoy a comfortable ride, thanks to the rubber outsole. Their toe box is spacious enough to allow enough breathing room for your toes while the multi-directional lug design on the outsole supplies adequate traction. A beautiful but simply designed pair of sneakers, the CHAQLIN Toning is engineered to keep your feet comfortable and stylish, while increasing your height by up to 5 cm. You can wear them as fitness shoes for walking, jogging, or running, among other uses. The upper material is air mesh and synthetic, which is lightweight and breathable. It allows your feet to remain cool and fresh, as well as odour-free. And with the pull-loop tab fitted on the back, wearing these fantastic shoes is effortless. If you are looking for height increasing elevator shoes for plantar fasciitis, then this is an ideal choice. Their footbeds provide great arch support while ensuring your ankles, knees and back are naturally aligned. On the other hand, the Rocker Bottom outsoles ensure your feet remain comfortable while helping you to build and tone your leg, ankle and feet muscles. Also, the Rocker Bottom outsoles supply exceptional shock absorption and cushioning, making these shoes great for standing or walking. Fashionable and comfortable, the Sfnld women’s shoes are a cool pair of height elevators for women, perfect for window shopping, dinner, or fetching groceries. They also boost your height by one inch. They come with uppers made of canvas material, which is not only breathable but light. Inside, they are lined with a soft floral lining to prevent blisters and other forms of discomfort that may arise after wearing shoes for a prolonged period. You will also love the padded collar, which enhances the comfort levels of these height increasing shoes for ladies. These shoes are highly flexible, thus making it easy to walk with them. Furthermore, their convenient slip-on design makes your work easier when you are wearing or removing them. Their sole is made of durable rubber, while the lug design ensures you have enough grip and traction when walking on different surfaces. You will also notice that these shoes are constructed with minimal seams, a design that helps to enhance their durability. With proper maintenance, these shoes can serve you for a long period. This unique and lightweight pair of shoes from Toto features a full-grain leather upper, durable rubber outsoles and an additional height of 2.6 inches. If you are looking for a pair of shoes that can provide an instant height boost without making it obvious, then these shoes are suitable for your needs. Although they are designed like ordinary sneakers, the height increaser is discreetly fitted inside to give you the lift you need. As noted above, they come with uppers made of full-grain leather, which is not only durable and sturdy but remarkably flexible. Inside, they are equipped with a soft lining, to ensure that you don’t experience any discomfort, even if you wear them for a prolonged period. They come with a shaft measuring 5 inches, while the collar and tongue are padded. With this combination of features, your ankles will have ample support, protection as well as cushioning. These height increasing elevator shoes for women are further equipped with height elevated insoles, which supply additional cushioning. The rubber outsoles provide further comfort, shock absorption and wear resistance. A pair of these Toto elevator shoes allows you to step out in style and comfort while giving you a boost in height and confidence. 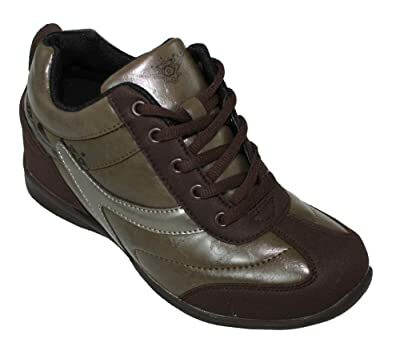 These elevator shoes for women are designed for a wide range of casual occasions. They feature a combination of light brown suede and dark brown leather, with a floral pattern to enhance their looks and style. The dark brown leather is used to reinforce most of the high-wear areas such as around the toe box, the heel area and along the eyelets to prolong the life of these shoes. Made of high-quality materials, these shoes will keep your feet comfortable while enhancing your physical appearance. Apart from that, outsiders will never notice you are wearing height increasing shoes, since the heel lift is inbuilt. On the other hand, their lightweight design helps to prevent fatigue, especially after wearing them continuously for many hours. They also come with a padded tongue and collar, which supply additional cushioning while the rubberized outsole provides grip and traction. Give your height a boost as you take care of your feet with the CALDEN – K9928 height elevator shoes for women. Just like other shoes from this brand, the K9928 is stylish, comfortable and durable. Their exterior looks like any other pair of shoes, which means you will be getting a height boost of 2.4 inches and no one will ever know your secret. Apart from giving you additional height, these shoes are also equipped with shock absorbing midsoles, which reduce fatigue. Wearing these shoes will give you an instant boost of height and confidence. They come with a wide width toe area, which prevents your toes from being squeezed together. Their leather upper comes with numerous aeration vents, to ensure that your feet remain fresh and cool, even during hot weather. Furthermore, these are double-stitched all through to enhance their durability while making them more stylish. And even with all these enhancements, these shoes still manage to remain lightweight. The K9928 are well-priced and can rest assured that you will get value for your money. Designed like your ordinary Chuck Taylor shoes, the MNX15 come with the additional benefit of boosting your height by 2.3 inches while keeping your feet comfortable throughout the day. These shoes are cute, lightweight and trendy. They come with uppers made of breathable canvas while their outsoles are made of abrasion-resistant and durable rubber. MNX is one of the most reputable brands when it comes to height increasing elevator shoes. Therefore, when you purchase these, you are assured of discreet height increment as well as support. You can wear these shoes for a game of tennis, walking around the neighborhood or shopping. Also, you can wear them with a pair of jeans for a trendy look and feel. When it comes to style, durability and lightweight comfort, the MNX15 are unmatched. From the above list, we hope that you will find a pair of height elevating shoes that suit your needs and preferences. You will also notice that our list contains a few manufacturers. As much as there are hundreds of manufacturers out there who make height elevating shoes, only a handful can match the standards and quality delivered by Chamaripa, CALTO, Toto and the others we have reviewed. Having said that, here are some of the factors you need to consider when buying height increasing shoes. You have numerous options when it comes to adding height through footwear. For instance, you can use heels, wedges, inserts, or platforms, among others. However, most of these options are not as discreet as height increasing shoes. People opt for height increasing shoes because they can add a few inches to their height and no one will ever notice. Each of the elevator pair of shoes in our list features the highest levels of discretion. Even those who are close to you will never know your secret unless you tell them. The shoes we have reviewed are designed in a way that ensures the height increaser is not noticeable. Instead, people will just notice how great or stylish your shoes are. Some height increasing shoes come with a curved heel box, which mimics the natural contours of the heel. With that design, the shoes appear normal from the outside. Others come with a smooth rise from the toe to the heel, making the shoes less noticeable. Furthermore, the smooth rise is significantly healthier for your feet as compared to a sudden rise. You might also come across some models that come with elegant stitching as a means of concealing the lift while helping to reinforce and strengthen the shoes. Apart from enhancing the durability of these shoes, elegant stitching also makes them more stylish. Decorative details can also be used to conceal the height increaser, by directing the eye to other features of the shoes. For instance, printed leathers, brogue detailing as well as wingtips are some of the common methods used to draw the eye away from the rear of the foot towards the front. As you can see, you have numerous options when it comes to the style. For instance, for casual occasions, you can choose height increasing sneakers. On the other hand, if you are going to a meeting or any other formal occasion, then a pair of height increasing dress shoes will work for. Other models can be used for both formal and casual occasions. But regardless of the model, you have chosen, ensure that it comes with enough discretion. No one should know your little secret. Heels, lifts, wedges, and inserts result in an unnatural position for your feet, and they can lead to long-term damage. Therefore, it’s important to choose a pair of shoes with an elevated footbed, which supplies adequate cushioning and support. Raised heels can make your ankles unstable, thus leading to various forms of pain and discomfort. It’s therefore advisable to look for a pair of shoes that have ample ankle support. They should also have a firm heel cup to keep your heels secure. Shoes with a padded tongue and collar will support your ankles while making sure they assume a natural position. Furthermore, shoes that come with a rubber outsole will also absorb some of the impact that’s usually transferred to the rest of the body, thus alleviating pain on the knees, ankles, and back. Also, you need to buy shoes with proper midfoot support. When buying shoes, most people tend to underestimate the importance of midfoot support. However, it’s one of the most important areas in the foot when it comes to balance. Furthermore, the midfoot is highly prone to injuries especially when wearing elevated shoes. Go for shoes with ample midfoot cushioning. Also, they should have proper arch support. If the footbeds lack arch support, then you can easily experience midfoot strain and pain. Forefoot room and cushioning are equally important when it comes to height elevator shoes. You should opt for shoes whose forefoot is spacious enough to support the balls of your feet. Apart from that, the forefoot should have ample cushioning to relieve pressure on the joints. Whenever you are wearing height increasing shoes, your forefoot should always feel secure and comfortable. You also need to ensure that the shoes you have chosen have a spacious toe box. Most shoes with elevated heels tend to have a narrow toe box, which can lead to immense discomfort and pain on your toes. Also, if the toe box is too narrow, you might end up with bunions. You might also fracture the small bones in your toes. And if the shoes feel too tight when you wear them for the first time, don’t think that breaking them in will create additional space in the toe box. Therefore, make sure that the toe box is not too wide or too narrow. It should be snug while leaving enough room for your toes to splay and breathe comfortably. If you encounter any form of pain or discomfort when wearing elevated shoes, then you should remove them immediately and choose another option. Comfort remains an important consideration when buying footwear, and the same applies to height increasing shoes. Shoes for increasing height come with various comfort features such as cushioned insoles, padded collars, ventilation, removable insoles, cushioned midsoles, as well as shock absorbing outsoles. The height increaser should come with ample cushioning to keep your feet comfortable even if you wear these shoes for an extended period. Apart from making the shoes comfortable, a cushioned insole also helps with even weight distribution. Choose insoles that conform to the natural contours of your feet. Also, they should not break down or deteriorate easily. As you probably know, your feet go through plenty of stress and strain, especially when you are wearing shoes with an elevated heel. A padded tongue and collar help to minimize the risk of blisters and sores around the ankles and the instep while providing additional comfort. Ventilation is equally important in all types of footwear. A dry, fresh and cool foot is healthy and comfortable as compared to one soaked in sweat and perspiration. Apart from that, adequate aeration in shoes helps to prevent the risk of fungal or microbial infection. Also, it’s important to note that too much sweat might lead to blisters and hotspots. Therefore, proper ventilation is as important as other considerations. The insoles, midsoles, and outsoles all play an important role when it comes to comfort. If you intend to customize your shoes further, all if you have sensitive feet, then you should choose a model that comes with removable insoles. On the other hand, the outsoles should be flexible to allow ease of movement, but sturdy enough to protect your foot as well as the rest of the shoe. Also, you also need to pay attention to the weight of the shoes. Some height increasing shoes are so heavy and bulky the fatigue you experience at the end of the day is not worth it. Your preferred model should be lightweight. But you should also note that the higher the height increase, the heavier the shoes. Therefore, try to strike a balance between the height increase and the weight of the shoes. Elevator shoes are also a fashion statement. And the good thing about these shoes is that they are available in different types to match your unique sense of fashion and style. 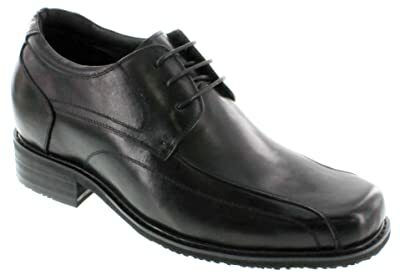 For instance, you can buy black elevator dress shoes to wear with bright clothes. On the other hand, you can purchase white height increasing shoes for casual events such as weddings, dates or a night out with family or friends. The secret to these shoes is understanding your personal sense of style as well as the theme of the event you are planning to attend. If you plan to wear height elevating shoes for an upcoming interview, then you should stick to formal styles such as oxfords and wingtips. On the other hand, if you intend to wear them for a wedding, then you can go with either a casual or a formal pair of shoes. But even as you choose a pair of shoes to match your style, you should never compromise on comfort. Once you have chosen your preferred pair of height increasing shoes, you need to maintain them in good shape. Regardless of the materials used to make a pair of shoes, the care and maintenance you give will determine how long they last. And considering that height increasing shoes are not like an ordinary pair of shoes that you can purchase every other month, it’s imperative to give them the necessary care and maintenance to ensure they last for long. As a result, you will get value for your money. Ensure your shoes are always clean when you store them. Never store your shoes when they are covered in dirt or mud. Therefore, immediately you arrive home, spend a few minutes removing the dirt, even if you will not be cleaning them completely. If your boots are made of leather, make sure your moisturize them. Height increasing shoes made of full-grain leather require to be moisturized regularly so that you can keep the leather supple and flexible. Application of conditioners is also recommended to maintain the shiny look. If your boots have snow or salt stains, ensure they are treated with the right substance to remove those stains. If the stains stay for a long period on the surface, they will eventually become permanent, thus damaging the appearance and quality of your valuable investment. When storing your shoes, it’s advisable to use shoe trees. Shoe trees help shoes to maintain their shape for an extended period. Also, check heels regularly. Just like other forms of footwear, height elevator shoes for men and women rely solely on the heel to deliver traction and elevation that you need. Therefore, check it regularly and ensure it’s replaced or repaired immediately it starts showing signs of deterioration. When buying height increasing elevator shoes, you need to remember that not all of them will satisfy your needs. Some are designed for wide feet, others are meant for narrow feet while others are designed for people with high arches, among other considerations. Therefore, you need to choose a model that suits your preferences. Also, the shoes you choose should also be versatile enough to be worn for different occasions. Apart from that, it’s important to ensure your feet are comfortable and properly supported. We know that height increasing shoes are a long-term investment and we hope that you will find a pair of shoes that suits your needs perfectly.